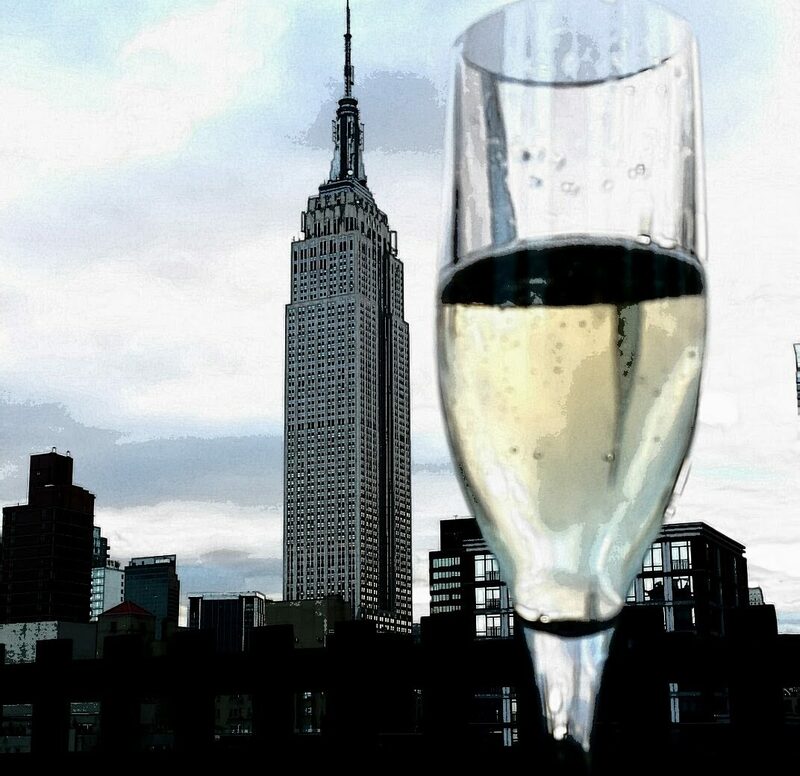 Some wines suffer from stereotyping through no fault of their own, Lambrusco one of my favorite wines to pair with many Italian delicacies from prosciutto to aged robust cheesy dishes definitely falls into this category. Many Americans still link the memory of this wine with catchy commercial jingles, bad 70’s style and overly sweet fruity plonk. Considering it’s origin of Emilia Romagna is this really fair? Emilia Romanga is the home of Proscuitto de Parma, Modena balsamic vinegar, Parmigiano cheese and other Italian gastronomic wonders often washed down with large amounts of locally produced Lambrusco ranging in style from dry to sweet. 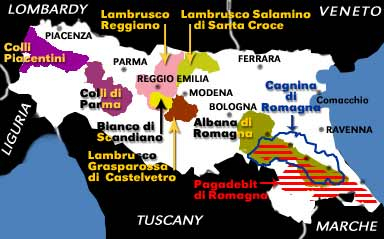 There are a number of Lambrusco wines with DOC status including Lambrusco di Sorbara, Lambrusco Grasparossa di Castelvetro and Lambrusco Salomino di Santa Croce. All are named after the town in which territory the grapes are grown. The Lambrusco variety has over sixty sub varieties scattered throughout Italy, the most significant being Lambrusco Grasparossa, Lambrusco Maestri, Lambrusco Marani, Lambrusco Montericco, Lambrusco Salamino and Lambrusco di Sorbara. Many Lambrusco producers will fully ferment the juice and purchase must from a cooperative to restart the fermentation just before bottling. Antonia feels that by purchasing another producer’s must she would lose control of quality and cleanliness. Instead, she uses temperature controlled/pressurized stainless steel tanks to partially ferment the juice and then cools it to 32 degrees. At the time of bottling she warms the juice and a second fermentation begins. The CO2 is trapped in the wine and bottled on the estate directly from the tanks. Bottling occurs fresh only as the demand requires. This is a far more expensive technique but from the different styles I’ve tasted definitely worth it. One of my favorite producers Villa di Corlo uses this method. Villa di Corlo managed and owned by Antonia Jacobazzi dates back to the end of the 1600’s and is located in Baggiovarra approximately 10KM SW of Modena in Emilia Romagna. 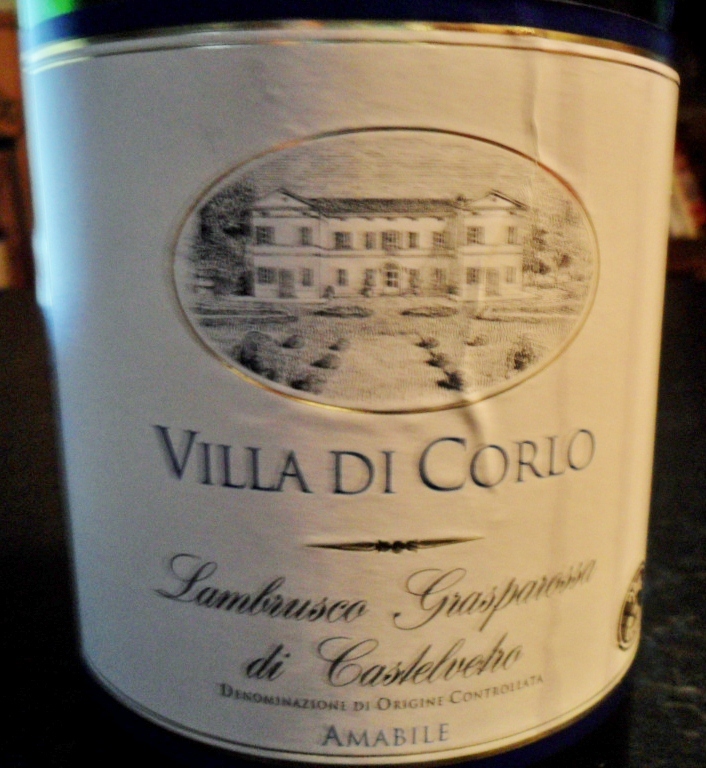 Villa Di Corla produces 5 different styles including the Lambrusco Grasparossa di Castelvetro, DOC and Amabile ( slightly sweet). Amible was the wine we had selected to pair with a feast we had planned. After chilling slightly we poured this dark frothy wine to sample before our meal. Flavors of blueberry, tart cherry and a full round rich fruits finished with light smooth tannins. I couldn’t wait to try it with the variety of dishes I had cooked up. 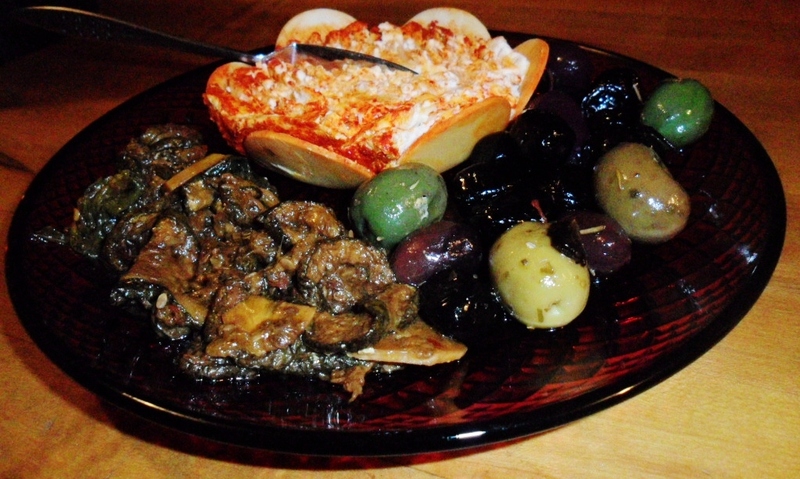 Lightly salt eggplant slices and set in colander to drain for 1/2 hour. This makes the eggplant less bitter and takes out some of the moisture. Pat dry and dip each peace in egg mixture then flour mixture coating evenly. 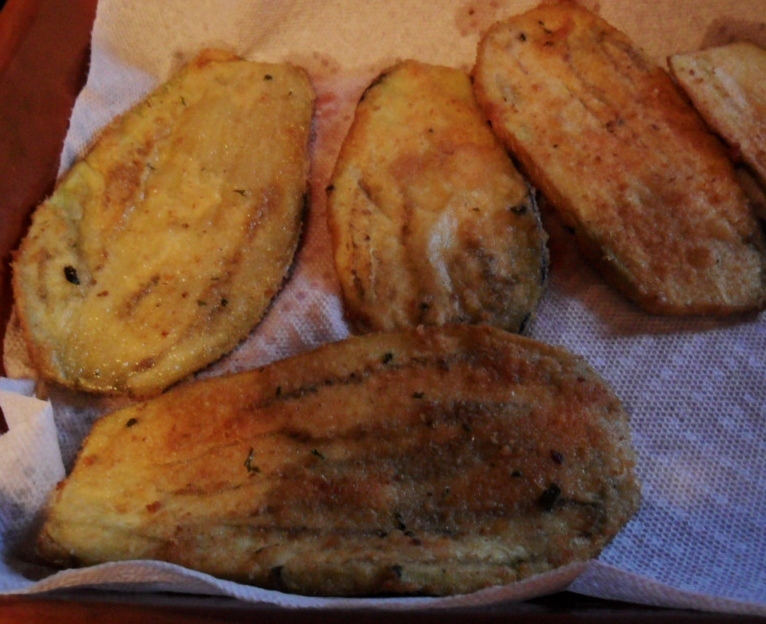 Heat 1/2 inch canola oil on medium heat and fry each piece till golden brown on each side. Drain on paper towel and prepare stuffing mixture by mixing blended cheeses, brocolli rabe, garlic and salt/pepper. 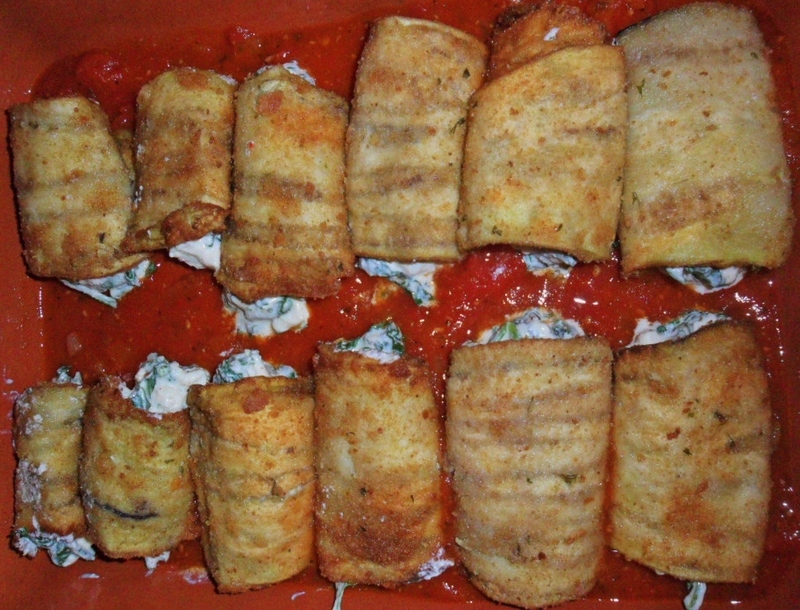 Lay out drained pieces length wise and put 1 to 2 tablespoons of cheese mixture on widest end and roll up laying pieces seam side down in long baking dish prepped with 2 cups of tomato sauce. Make sure not to crowd pieces as they will soak up sauce and expand. I make my own sauce but if you like you can sub your homemade version for a store bought version if you are short on time. Preheat oven to 350 degrees. After filling prepped dish with all roll ups top with remaining sauce and bake for 45-50 minutes. 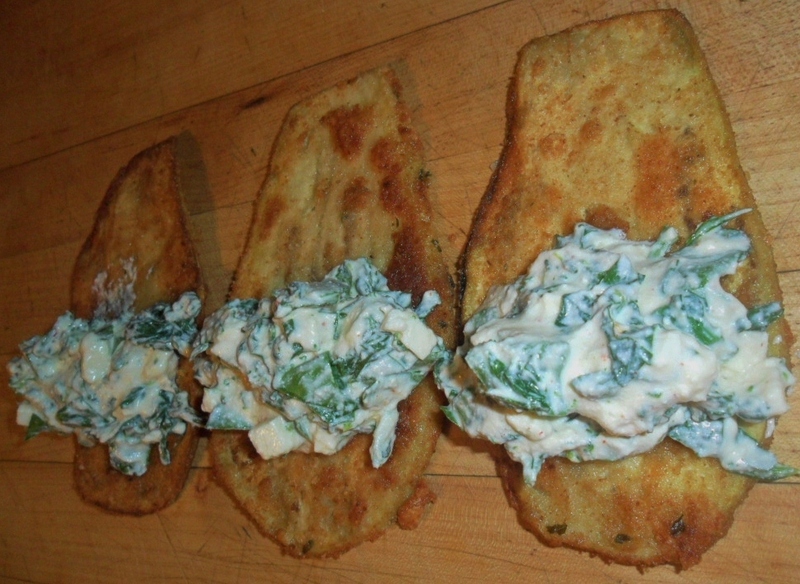 Top with additional sauce, a good grated cheese or fresh basil if desired. Enjoy!